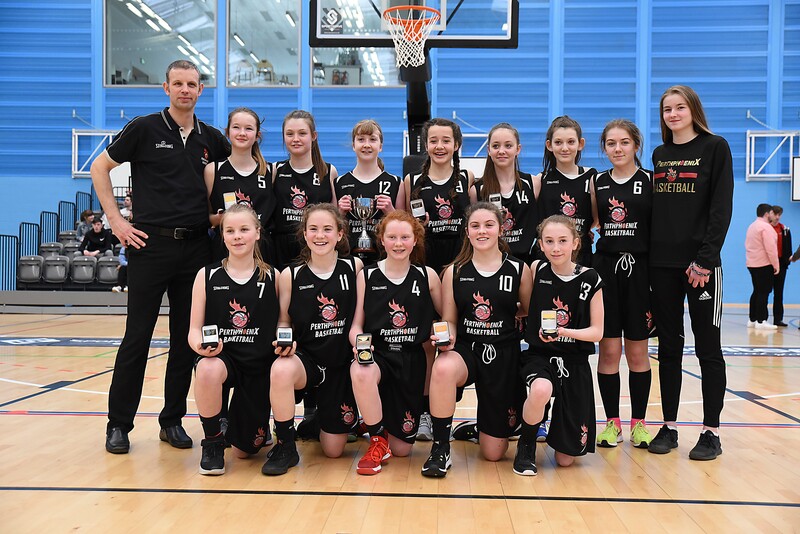 Perth Phoenix took the victory in the U14 Girls Cup Final against City of Edinburgh as they pulled away in the second half of the game and came away with a 54-34 victory. The second of the u14 Scottish Cup Finals games came on day 2, this time seeing the gitls compete for the cup as City of Edinburgh Kool Kats took on their 4th final of the weekend as they faced Perth Phoenix. It started a tough contest as the girls went back and forth keeping the officials on their toes. The girls were 8 all after 7 minutes, Aoife Loftus contributing big to her Kats score line with strong finishing inside. After 1 period of action it was 10 all, showing the crowd that they were in for a thrilling game. A fantastic play drawn up by Kool Kats coach Lorna Norman got her girls scoring immediately out of the gate. Perth Coach Russel Kesson had sorted his girls defence after that however and they built up a little 3 point lead. Again, the teams went back and forth however, Kats managed to get some stops and get a 1 point lead with under 3 minutes remaining in the 2nd half. Kats kept up the intense defence, playing with physicality and hustle and refused to allow Perth any baskets for a solid 2 minutes. Things slowed down for both teams as they became tied at 22 at half time. Turnovers were an issue for Kool Kats in the 3rd quarter as Perth built up another little 3 point lead midway through, in this tight a contest, 3 points can be a significant margin. Perth could have been ahead by more after all the turnovers they forced, if it wasn’t for the excellent transition defence taught by Coach Norman to her girls, it kept them in the game. A lid seemed to have been placed on both baskets as the girls threw up good shots but they just wouldn’t fall for either team. Perth managed to lift the lid and pull away in the final minute of the 3rd quarter, a staggering 12 point lead to end the 3rd for Phoenix, 40-28. Holly McIntyre was proving to be an X-Factor for her Phoenix as she played facilitator for her teammates to score and boost their lead over City of Edinburgh Kool Kats to 18, 48-30 with just under 4 minutes remaining. The girls went back and forth with some exciting action on the defensive end from both teams. Perth Phoenix went on to defeat City of Edinburgh Kool Kats 54-34 and were crowned the 2018 u14 Girls Scottish Cup Champions. • City of Edinburgh Kool Kats – Corin Kemp 12 points. Becky Jackson as awarded the Molten Sports MVP with 10 points, 6 steals and 8 rebounds.